Inc. magazine today revealed that Pinnacle Solutions, Inc. is No. 1558 on its 37th annual Inc. 5000, the most prestigious ranking of the nation’s fastest-growing private companies. The list represents a unique look at the most successful companies within the American economy’s most dynamic segment—its independent small businesses. At the state and local level, Pinnacle ranked the No. 12 fastest growing company for the state of Alabama and the No. 5 for the city of Huntsville. 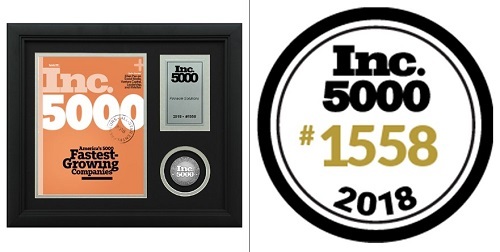 As a 6th time honoree, Pinnacle has been inducted into the Inc. 5000 Hall of Fame. Pinnacle Solutions is a CMMI-DEV Level 3-appraised and AS9100:2016 / AS9110C / ISO9001:2015-registered Employee Owned Company headquartered in Huntsville, AL. Pinnacle is a leading innovator, developer, and provider of flight and maintenance products and services, with proven expertise in aviation operations and instruction; training system development, sustainment, and modification; live, virtual, and augmented training environments; interactive multimedia instruction; and IETM/technical publication development.